Do services include a wash? Yes, all hair services include a wash (shampoo and conditioning) except for consultations. Do you offer natural hair styling (braids, twists, cornrows)? Yes. Please see our service menu for details. If you want a specific style, please send a photo to info@racheljoyceorganicsalon.com and we can get back to you to confirm the service and pricing details. Yes, we use Phyto Specific Relaxer. It is soy based and doesn’t have a strong smell. It is the most gentle and effective relaxer that we’ve used. Wait four (4) days after the initial treatment before shampooing the hair or getting the hair wet. This allows the treatment to cure. During the curing phase and prior to the first shampoo, do not wet the hair. Do not use styling products or clip/tie the hair back. Keep the hair dry and straight. If the hair does get wet or damp from rain or perspiration, etc. blow dry and flat iron the hair immediately as needed. Clients may also touch up any kinks or curls with a flat iron and/or blow dryer as often as necessary before the first shampooing. This will help to seal the cuticle and expose soft, manageable, frizz free hair with shine. After day 4, it is important that the clients use the Smooth Rituals Awakening Shampoo and Smooth Rituals Calming Conditioner at home. This will continually enhance the Keratin Treatment, where others may strip the keratin from the hair and be too aggressive. The Smooth Rituals Renewal Treatment is also recommended to renew the Keratin in your hair. We offer single/double strand twists that you can use to lock your hair, however we don’t offer loc start services specifically. If I come with my hair washed is the service price cheaper? No. Additionally, the stylist may have to wash your hair regardless of at home care. Do I need my hair straightened to get a trim? If your hair is longer than 2 inches and curly, the best way to get a healthy trim is to at least have your hair blow dried prior to trimming. If you don’t, you’re going to have far too many split ends remaining after the trim, which is why we require it. Having your hair flat ironed is not a requirement, however some individuals prefer to have their hair pressed prior to the trim. Can I bring my own products? No. 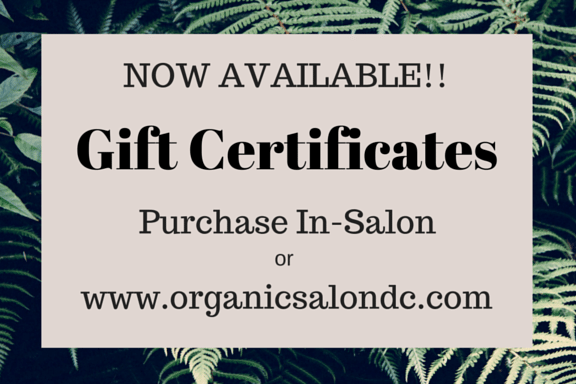 However, if you have a prescription, please send an e-mail to info@racheljoyceorganicsalon.com for consideration. We primarily use Organic Colour Systems for color and Organic Way for shampooing, conditioning, and styling. Yes. As long as your child can be relatively still and follow basic instructions from the styling staff, we’re more than happy to accommodate. We encourage a consultation prior to the visit date to help your child get familiar with the facility. Does your salon have parking? While we don’t have a dedicated parking lot, there is street parking and garage parking in Adams Morgan. 99% of our services rendered come from appointments. However, we do take walk in customers if there is availability. Why can’t I book color services online besides grey coverage? We require consultations for highlights and double process color services. We’ve also found that individuals generally aren’t 100% certain what category their service falls into unless it is for grey coverage. You can send a picture of your current hair color and the desired outcome to info@racheljoyceorganicsalon.com to start the conversation. Alternatively, you can schedule for something more routine and discuss the look you’re trying to achieve with your stylist.